These natural remedies for eczema will be extremely helpful to you if you suffer from eczema, an irritating skin condition that causes inflammation, blistering and itching. Eczema is the result of an abnormal functioning immune system. This is probably why people with eczema are so sensitive to external pollutants, like pet dander, chemicals, harsh detergents and a lot of skin care products. Eczema is not only itchy, uncomfortable and sometimes painful , in severe cases these rashes can be very noticable and embarassing. Eczema becomes red and inflamed, and in some instances it becomes scaley and a crust can form which can lead to oozing cracks in your skin. While suffering from eczema is nothing to be embarassed or ashamed of, when you are the one suffering from it, it is hard not to be self conscious about it. The good news is that you can find relief with natural ingredients and healthy eating. Below are natural remedies for eczema that will provide you with relief as well as being good for health. There are many natural remedies for eczema that provide results and relief without expensive trips to the doctor. Using natural remedies for eczema produces a better and healthier result with your skin than steroid creams and other expensive medications. Identify any external allergens you may have. Eczema is very common in infants, and for those who have it persistently as an adult, the first thing you want to do is to find out if there is an allergen trigger. Some people just have naturally sensitive skin and finding out if there is a detergent, soap or even a type of fabric that irritates your skin, can eliminate the problem to a large extent. This isn't always the only answer and there are other natural remedies for eczema treatment that can provide relief. Soaps or detergents may not be the cause of your eczema, but they can certainly make it worse with synthetic perfumes, chemicals and other irritants. Pay very close attention to anything you apply to your skin, what kind of laundry soap you use, shampoos, conditioners, make up or anything else that could irritate your skin. Make note of any changes in brands etc. This may sound like a pain in the behind, but one of the best things you can do is keep a journal of when your eczema flares up, new products introduced, products you may try excluding, even when your skin seems to be clearing up. Try to take notice of what some of the main ingredients are in each product, maybe even jotting down the first for or five ingredients. Be sure to write a date beside each entry. You should eventually be able to pinpoint what products or particular ingredients irritate your skin and that you should avoid. It does sound like a lot of work but if you suffer from eczema I think you will find it is well worth it. It really only takes a little extra time and you can't put a price on the relief you will find. It is unfortunate that we live in a society where just about everybody wants a quick fix and then they are dissapointed again and again when these miracle treatments fail to deliver. This is not an overnight process. If you are patient and you figure out what things trigger your eczema, you will get to know what you can, and what you can not put on your skin. It will become second nature to check ingredients in new products etc. You can win the fight with natural remedies for eczema! Cotton is said to be the best choice for eczema prone skin, especially undergarments, pajamas and bed sheets. One of the most overlooked natural eczema treatments is the most obvious. This is an extremely important part to any natural remedies for eczema. Drink plenty of water to stay hydrated. Water also helps flush out toxins which are your worst enemy if you have eczema. Always try to get at least your eight glasses a day. The food you eat may actually make eczema worse. There are some foods which have been tested for triggering outbreaks of eczema prone skin. These may be foods to eliminate from your diet. You can try reintroducing them if you see an improvement in your skin. Keep a food journal as well to see if you can find a link to what you eat and the severity of your eczema. Try to eat foods that are high in essential fatty acids and rich in antioxidants. (blueberries, raspberries, green tea etc.) Foods high in Zinc, Vitamin E and Vitamin C are very helpful in helping heal eczema. Keeping track of your food choices in a journal will also help pin point any foods that are a problem, or foods your skin reacts well to. There are a few simple natural remedies for eczema you can try at home. These are inexpensive, and many people report good results. Dead sea salt baths are excellent for soothing skin inflammations. They are rich in minerals that your skin loves, and can help reduce pain. Sea salts naturally hydrate and improve circulation to the surface of the skin which aids in healing. Sufferers of eczema should be careful not to take baths too often, or to soak for extended periods of time. You of course want to be sure your bath water is not too hot which can strip your skin and counter act any benefits from the salt. Aloe vera soothes itching, reduces inflammation and helps with healing skin. The nice thing about aloe is it provides quick relief and you can apply it as often as you like. This is another natural ingredient that can be massaged on to your skin all on it's own, and one of the natural remedies for eczema that many people swear by. Emu oil is the closest in molecular structure to the oil our own bodies produce and it absorbs very easily in to the skin. It contains powerful anti oxidants, is very high in essential fatty acids, is antibacterial and can excelerate healing. It can help relieve the discomfort from eczema and is worth trying if you have no objection to using it. (This is obviously not suitable for everyone. Vegans etc.) When applying to your skin start off using a very small amount until you get to know how much to use. You don't want to end up a slippery mess, a little goes a long way. Calendula Calendula increases circulation to the surface of the skin which helps with collagen production which in turn is used to heal skin and connective tissues. This can help speed up healing of eczema. Chamomile Oil This oil is soothing and calming and has antibacterial properties. Eucalyptus Oil Eucalyptus stimulates circulation to the surface of the skin and is also well known for being useful for killing germs in winter months. Juniper Berry Oil An excellent astringent that has antiseptic qualities. It is also useful in cellulite treatments. Lavender Oil Lavender oil is a natural antiseptic and cleanser that also increases circulation to the skin's surface. Patchouli Oil This oil is a natural inflammatory that regulates oily skin and tightens pores. A good choice for treating eczema and psoriasis with the benefit of wrinkle fighting properties. Neem Oil While the smell does not agree with some people this oil is used to treat skin disorders like eczema and psoriasis. It has antiviral, antifungal, antibacterial properties and is an effective natural antiseptic. It is also well known for making a good bug repellant. Neroli Oil Neroli is good for balancing skin's oils. It aids in regenerating skin cells making it a good choice for your skin care even if you don't have eczema. Tea Tree Oil This is a quite well known oil for its antiseptic and healing properties. It is an excellent anti inflammatory and cleanser for eczema. Vitamin E Oil This is a very effective antioxident for eczema. It aids in healing and can help prevent scarring. Wheat Germ Oil Wheat germ is full of nourishment for your skin. It soothes and moisturizes irritated skin, and is very rich in Vitamin E which is wonderful for treating eczema. Witch Hazel Witch hazel is a natural astringent and cleanser and is high in antioxidents. It heals and soothes and can be used on it's own to reduce redness and inflamation. Many people that suffer from eczema claim that as part of the natural treatments for eczema you need to detoxify your body. The body sometimes doesn't release all the toxins that it takes in and using a cleansing program can help tremendously in relieving conditions. There are several ways to detoxify your body; research and find the one that matches your needs the best. At the very least ensure you are drinking plenty of water everyday. Supplements, such as fish oils or Vitamin E are good at providing your skin with moisture from the inside out and are very helpful in treating eczema. Talk with your pharmicist about what amounts to take and be sure you tell he/she what you are taking it for. You can beat eczema as long as you are vigilant and with your diet and use natural ingredients that will heal instead of damaging your skin. Find relief for your eczema with these natural remedies for eczema! 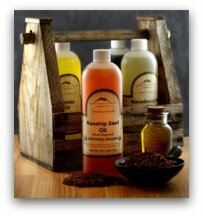 Visit Mountain Rose Herbs for all of your natural skin care ingredients.